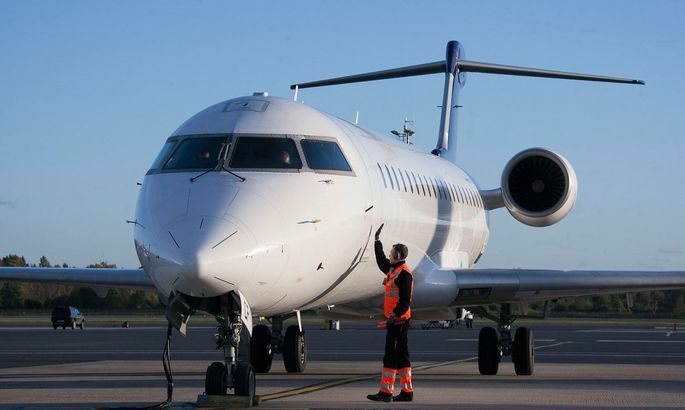 Üks kahest Estonian Air´i uuest lennukist Bombardier CRJ-700, mis oktoobri algul Tallinna saabusid. Estonian Air will be binned as trademark even if company gets green light by European competition authority to continue being pardoned the massive state aid as national airline. In his final working day yesterday as marketing chief for Tallinn Airport, Mr Sakkov turned tongue-tied about steps in store for the newborn firm, citing toughness of the competition. «Who wants the competitors to be able to react in advance to steps planned by us,» he said. The fewness of words may also have been due to the feverish tempo of creating the company wherefore the parties involved have had no time to agree about details. By economy ministry, Postimees was shown two possible solutions. If Brussels wipes out Estonian Air, the planes belonging to the company will go to the state enterprise Transpordi Varahaldus (Transport Asset Management). Nordic Aviation Group will be managing arrangement of flights and ticket sales. But should competition watchdogs nod okay regarding state aid granted to Estonian Air, Nordic Aviation Group will become a holding company to which will belong owner of the planes Transpordi Varahaldus and flights organiser Estonian Air. However, chairman of the new airline Peeter Tohver said that Nordic Aviation Group would only begin operating if Estonian Air is closed down. «For the people who have left their current workplace to manage the new airline, the game may be over before it begins – this is business risk,» explained Mr Tohver. «Whatever the solution, the business will be taken over by Nordic Aviation Group,» assured economy ministry public relations chief Rasmus Ruuda, adding that the chairman must not be current yet as to the owner’s will. Having signed a memorandum of intentions with economy ministry a year ago regarding assuming ownership of Estonian Air, Infortar confirmed in the current situation privatisation of the airline is no longer on the agenda. The company’s board member Ain Hanschmidt said they have come to thoroughly know Estonian Air during two years and sowed two of their best men as seeds into Estonian aviation: Jaan Tamm, and Ahto Pärl who will be financial director. «Now, it is a hundred percent certain that Estonian aviation will remain and at the present combination we have no ambitions to become owners,» he said. Managers of Estonian Air have not been informed about how management of the company would be reorganised if competition authority proclaims state aid legal. In the opposite scenario, all lines will immediately be closed down and both passengers and employees face a hard landing, said CEO Jan Palmer. «In high likelihood, a negative decision from Brussels will be followed by orders of Estonian Air council to immediately stop the flights,» noted Mr Palmer. He added that the new airline Nordic Aviation Group will not then be able to take over Estonian Air’s flight licences and contracts but will have to enter into his own. Mr Palmer said lots of Estonian Air’s employees would probably receive an offer from the new company, but all cannot be guaranteed continued employment. Though council of the new airline had been appointed by economy minister Kristel Michal, and it immediately announced hiring of executive managers, as at yesterday commercial register featured no such state enterprise as Nordic Aviation Group. Indeed, a company by said name had last month been established by Triniti law office partner Ergo Blumfeldt while promptly renaming it private limited company Eminus. Same was true regarding Transpordi Varahaldus intended as owner of Estonian Air’s planes – also established at end of September, it’s name was changed into Logintas two days ago. People linked to creation of the new airline said the game is intended to protect the procedures around establishing the company. From what threats and how, we failed to find out. Estonian Air got €37m worth of various state support but would have to pay pack close to €43m with interests. The sum is significantly above the €40.7m planned by government to energise the enterprise from 2016 budget. Just a month ago, Mr Michal presented a solution under which, in case of positive decision by Brussels, the €40.7m intended to establish the new company would be used as capital payment for Estonian Air, and the latter in turn would pay back state loan to the same amount. «Nordic Aviation Group aims to create the world’s coolest airline regardless if it can be done in cooperation with Estonian Air or whether we start from scratch,» said commercial director for the fledgling company Erik Sakkov. He called upon people to suggest a fitting name for the new airline. Please post your ideas to «suggesting a name» e-mail address: pakunnime@gmail.com.